A reader asked if there is a resource that lists recommended books by tribal nation. I don't know of such a list, though I certainly understand that it would be tremendously useful to teachers and libraries looking for books specific to their geographic location. Of course, any book listed on my "Recommended" list is there because I think it is of value and should be in every school and public library. A word about the books sold by Oyate (http://www.oyate.org/catalog/index.html): They are very careful in selecting books they sell. That is why I list them as "best resource" for getting these books. AND, they have books that don't get attention from major review journals. Let me explain... Books published by the big publishers (Dial, Scholastic, Harper Collins) have BIG budgets. They send copies of their books to the major review journals. Small publishers can't afford to do that. In terms of Native-authored children's books, a good chunk of them are published by small publishers, and some are self-published. So, great Native lit is overlooked. It needs word-of-mouth attention. To grow this body of literature, all of YOU have to buy it, and you have to ask for more of it. You can do that by writing to publishers when they publish something you like (or when they publish something you don't like, too). A publisher's mailing address or website is usually printed inside the book. Back in the mid 90s I was reviewing for children's lit review journals. I was sent LOTS of books to review. 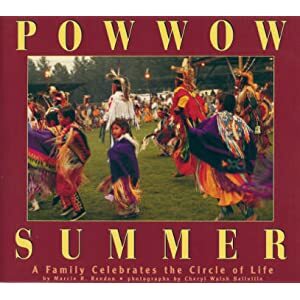 Most were pretty dismal, but there were some gems in there, and Marcie Rendon's book Pow Wow Summer: A Family Celebrates the Circle of Life was one of those gems. Her book (called a "photo essay" because it uses photographs to tell a story) follows an Anishinaabe family through a summer. 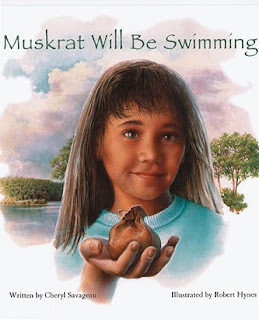 Like Muskrat Will Be Swimming (see my blog on July 6, 2006) by Cheryl Savageau, it is just what we need to help kids know that American Indians didn't vanish or ride off into the sunset. Savageau's book is a work of fiction. Rendon's is non-fiction. Get both. Rendon has a website. I'll note it here, and add it to my links to Native writers websites. In the landscape of words and phrases that are somehow associated with American Indians is "Happy Hunting Ground." After a time their grief subsided and they rejoiced to remember that their brother had gone to the Happy Hunting Grounds above the sky. I'll spend more time digging on that phrase... Who said it first? Was it an American Indian? What tribe? Why? Skeptic that I am, I'll bet it was a non-Native person... A writer perhaps, or maybe a hobbyist! The hobbyists were (and are) pretty prolific at coming up with "Indian lore." Update at 8:40 PM: Amazon has a nifty option, that allows you to search the text of a book. On a hunch, I searched James Fenimore Cooper's books and found he used "Happy Hunting Ground" in Pioneers, on page 760. That book came out in 1823. (Last of the Mohicans came out in 1826.) Any librarians reading the blog? If you can find an earlier reference, that'd be terrific! When my daughter was in 3rd grade (eight years ago), one evening while doing reading homework, she said "Mom, I don't get it." She's a smart kid, so when she told me she didn't get it, I knew something was up. I asked her what she was doing. She held up Caddie Woodlawn. I knew right away what was coming. I was well into my graduate work by then, which centered on representation of Native Americans in children's books. Given UIUC's mascot ("Chief Illiniwek), Liz and I had (by then) many conversations about racism and representation and stereotyping. And so we were reading it and when we got to the second chapter, it said, I'm not sure exactly what it said, that the Native Americans were sneaking around like dogs, and they picked up Caddie Woodlawn by her hair, and they were acting like dogs sniffing a bone. In another part it said that the Native Americans were massacring, murdering, and scalping the pioneers and made belts out of their hair and skin. They made the pioneers seem like angels and the Native Americans like inhuman monsters. I felt hurt inside, my eyes were watering, and I felt like I wanted to cry. But then I thought, there's something I can do about this. In the remainder of her essay, she goes on to talk about how, the next day, she went to her teacher and the group to tell them how she felt about the book, that she wanted them to drop it. Due to the careful work of the teacher prior to this (social justice), the group had great empathy and agreed to choose a different book. Liz's best friend at the time was also in the group. She said she didn't want them to pick a book that made white people look bad. In the end, I bought 10 copies of Erdrich's Birchbark House and that is what they read. This episode brought out a lot. The teacher chose this book because they were studying historical fiction, and she wanted them to read something located in or near the Midwest. She was using best practice in that regard. And, it was convenient because there were multiple copies of the book available at the school. She thought it would give the students the opportunity to deconstruct a flawed book, applying their critical thinking skills to issues of representation, etc. Liz and I talked more about that episode. She said that when they (they were taking turns reading aloud) came to the phrase "Indian John," the boy who was reading at the time stopped and asked for a conversation about that name, suggesting they should change it (drop the "Indian). They talked about it, doing a fine job of applying critical skills. There were 5 kids in the group. In round robin style, each spoke about what they thought of the suggestion to drop "Indian." Child one said drop it. Child two said drop it. Child three said drop it. Child four was Liz's best friend, and she said she thought they should leave it as the author intended. Liz was next. Think of her dilemma. Follow her heart and vote to drop it, thereby leaving her best friend all alone in her vote? Remember---these are smart kids, but they're only eight years old. Liz voted with her friend, but they lost the vote anyway, and from that page on, the group did did not read aloud "Indian" when they came to that character's name. I encourage everyone to get A Broken Flute. There are many essays in it, but also hundreds of reviews of books with American Indian content. A Broken Flute and Through Indian Eyes, both available from Oyate, are the very best resources out there to help teachers and librarians gain understanding and knowledge necessary to help them do a better job of teaching about American Indians. One area of my research is the analysis of American Indian folktales that are marketed as picture books for children. I submitted an article on that topic to Language Arts (a journal for elementary school teachers). It will come out in their January 2007 issue. The article title is "Proceed with Caution: Using Native American Folktales in the Classroom." It features in-depth analysis of two picture book folktales: Turkey Girl by Penny Pollock and Dragonfly's Tale by Kristina Rodanas. In the multicultural fervor, we seem to think that folktales are the best way to go. It might be, if the folktales were accurate in their presentation of Native cultures, but as I demonstrate in the article, it isn't easily done and the final products can be deeply flawed. I strongly urge teachers and librarians and parents to get books that are about modern day Native people. Those that incorporate elements of traditional culture can do a lot to help children know that Native people are still here---that we didn't vanish. An excellent example is Cheryl Savageau's book Muskrat Will Be Swimming. It is about Jeannie, a modern day Native girl whose family lives by a lake in what is called a "shanty town" and how she feels about being called a "Lake Rat" by kids in her school who live in "big white houses uptown." One evening when she is feeling especially blue about being called a Lake Rat, her grandfather tells her the traditional Haudenonsaunee creation story about Skywoman. In the story, Muskrat (a lake rat) brings earth up from the bottom of the lake to put on Turtle's back so the Woman who fell from the sky would have a place to stand. This moment with her grandfather strengthens Jeannie. Read more about Muskrat Will Be Swimming at this site: www.tilburyhouse.com. Today (July 6, 2006) it is featured in the top left corner of their website. I often get private emails from teachers asking about best practice in terms of teaching about American Indians. Over a series of blog posts, I'll answer some of the more common questions. Question: Is it ok to dress up in Indian costumes and dance to teach about Indians? "Costume." The clothing that we wear when we dance is not a costume. It is traditional clothing that isn't worn everyday. "Dance." We dance---not as performance or entertainment---but as a form of worship. It is best to think of Native dance as prayer in motion. There are exceptions to this, of course. There are social dances, too, and there are performances of Native dance, but even with them, there is a lot of significance that distinguishes them from things like hip-hop or square dancing. "Dressing up (like Indians)." We don't "dress up" for our dances. We get dressed. I put on my traditional clothes to take part in a traditional dance. "...like Indians." As a society, we've been dressing up like Indians for such a long time (birthday parties, scouting, Halloween) that we rarely (if ever) pause to think about that activity. If you consider dressing up like a different group, perhaps you can see why this is not a good idea. Would it be appropriate to dress up like Japanese? Africans? Latinos? And do a dance that you think is Japanese, or African, or Latino?